If you are building anything; be it from an airplane, nuclear submarine to your laptop or phone motherboard, even typical electric fan repair that involves making a joint between components in an electronic circuit, then you need a good soldering iron. A soldering iron is common hand tool used for soldering of two elements together to allow electricity to pass through them. Nowadays you can get various types of the soldering iron in your hardware stores or on-line marketplaces like Amazon, Wal-Mart, eBay and others. These soldering irons come in different sizes and shapes and choosing them depends on your need, it also depends on how you want to use them. When it comes to choosing your perfect soldering iron, you have to choose between buying the one you have to plug regularly into electrical fuse every time you need to make use of it or get something very convenient like cordless or battery operated soldering iron that spares you the hassles of looking for where to plug in your soldering iron before you can get to work. Other factors to consider when choosing your soldering iron includes the wattage, type of the soldering iron, temperature control and tip size and shape. We have gone through several cordless soldering irons and short-listed two best cordless soldering irons. This solid device that gives you the edge in fixing up your electrical components quickly. 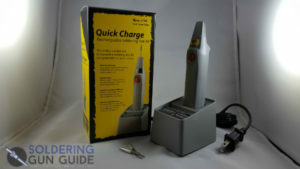 It is powered by AA alkaline or nickel hydride (Ni-MH) batteries depending on your choice; this soldering iron requires just your battery power to do all your soldering works. You can use this battery operated solder to fix together your electrical wirings, alarm systems, cars and another thing you desire to solder together. Hakko FX-901 is unlike any other soldering iron you have ever used before; it comes quality made for all your needs. The only disadvantage of using the Hakko FX-901 is just the lack of temperature control and battery meter, but it does not matter as you do your work effectively without needing temperature control and battery measuring meter. How much Does HAKKO FX-901 Soldering Iron Cost? The Hakko FX-901 is fairly economical; we felt that’s a great value for such a useful device. Need a cheaper alternative to HAKKO FX-901? However, if you are looking for little cheaper one , then you need to try out the new Tekpower TP-09 Cordless Soldering Iron, the solder Iron with spotlight that works great like the efficient Hakko FX-901, it provides both convenience and portability that you see on Hakko FX-901 and comes in at a lower price. Unlike the Hakko FX-901 soldering iron, the Tekpower TP-09 cordless soldering iron has a bright LED flashlight atop it that enables you to solder even in the dark surface. Tekpower TP-09 is another best wireless soldering iron you can try, it works efficiently, it had a super high quality and made for you convenience and comfort, no hassle carrying your soldering iron to travel, you can easily pack it in a bag. Need work done fast? Fix your battery and get your soldering job done in minutes, no need waiting for electricity. We recently reviewed the ISO-TIP 7700 Quick Charge. Be sure to check out that review before you buy a cordless iron!